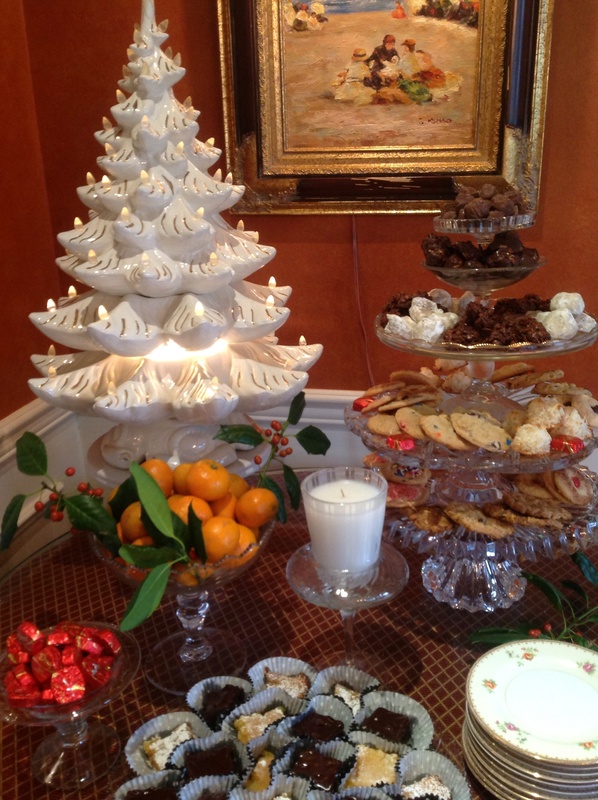 It would not be Christmas without the famous cookie tower in our family. Throughout the month of December I make and freeze several types of cookies. 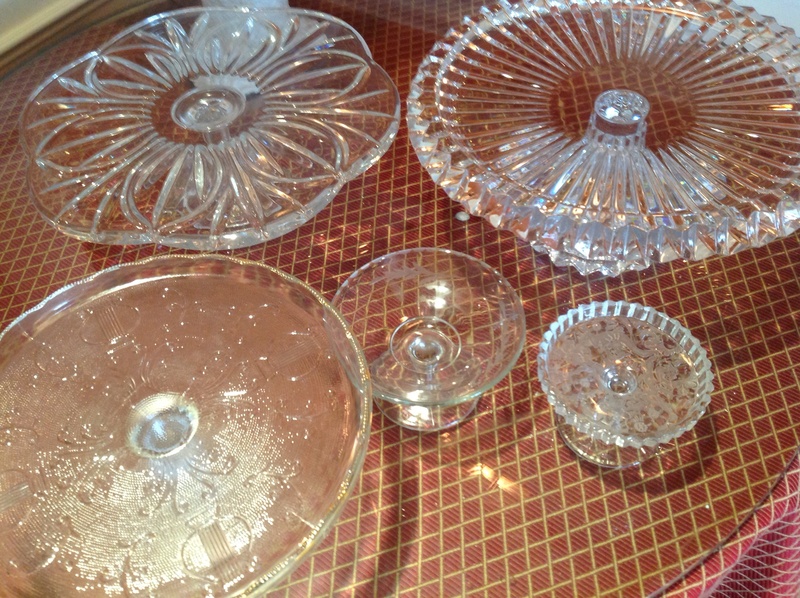 This is a true labor of love as I am NOT a baker! The anticipation builds as the month progresses. 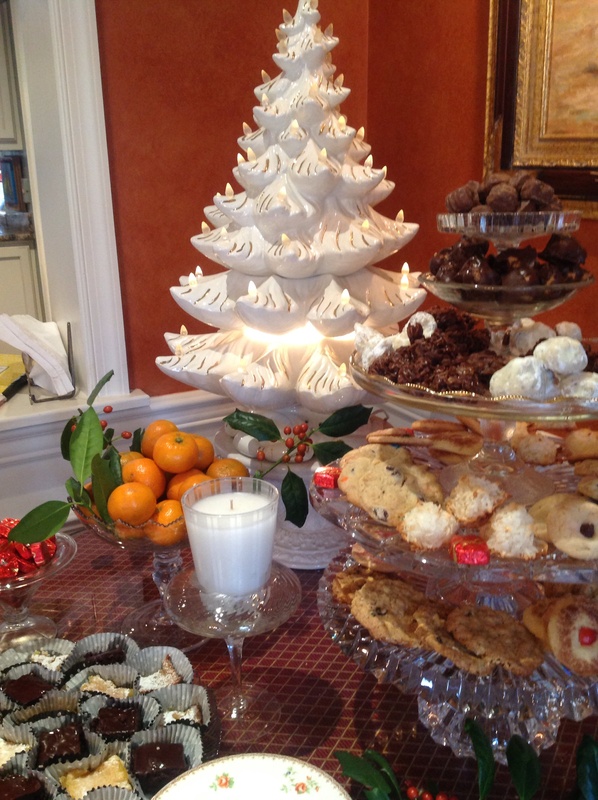 Come Christmas Eve, we host a Réveillon dinner party and the cookie tower is the star of the menu. Constructed by stacking 5 glass cake stands or pedestal dishes in gradated sizes, it becomes a towering display of Christmas sweets. The great thing about the tower is that it can be replenished as the cookies vanish. During the holidays we do “serial” entertaining. This cookie tower is a lifesaver as it Is set up once and refilled as needed. It makes frequent appearances from dinner one night, to brunch the next day to impromptu dessert for an unexpected gang of friends of our college-aged sons who happen to drop in and stay for dinner. It is always popular, versatile and makes dessert a no-brainer. 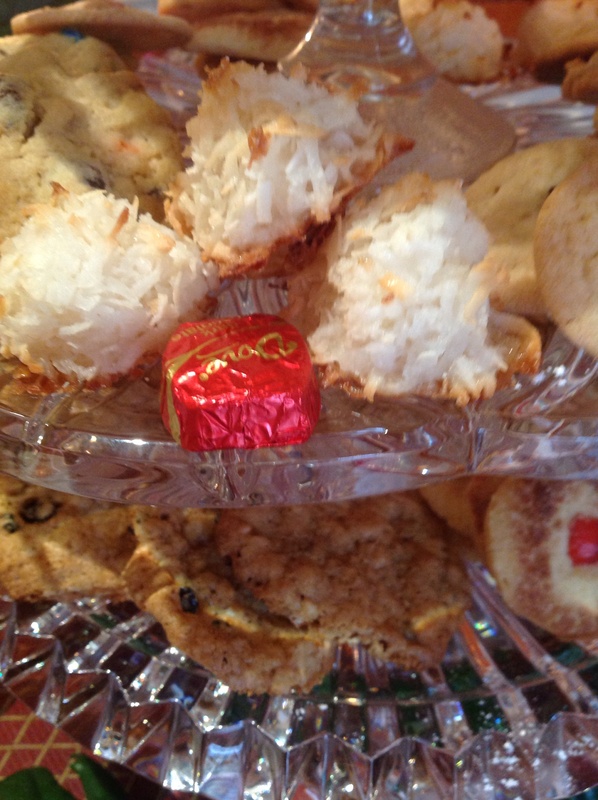 Set out a variety of cookies and sweets on each level starting with larger cookies on the lowest level and finishing with the smallest sweets like truffles at the top. 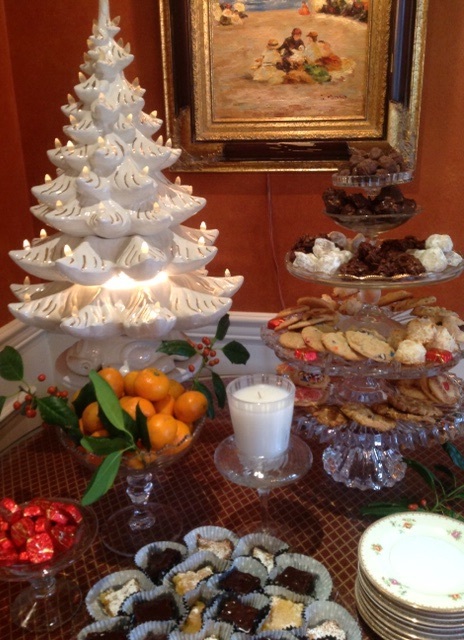 Because the serving dishes are glass I decorate this table as a winter wonderland with a vintage ceramic tree that lights up and stands just a little taller than the tower of sweets. Did you grow up with or inherit one of these classic ceramic trees? 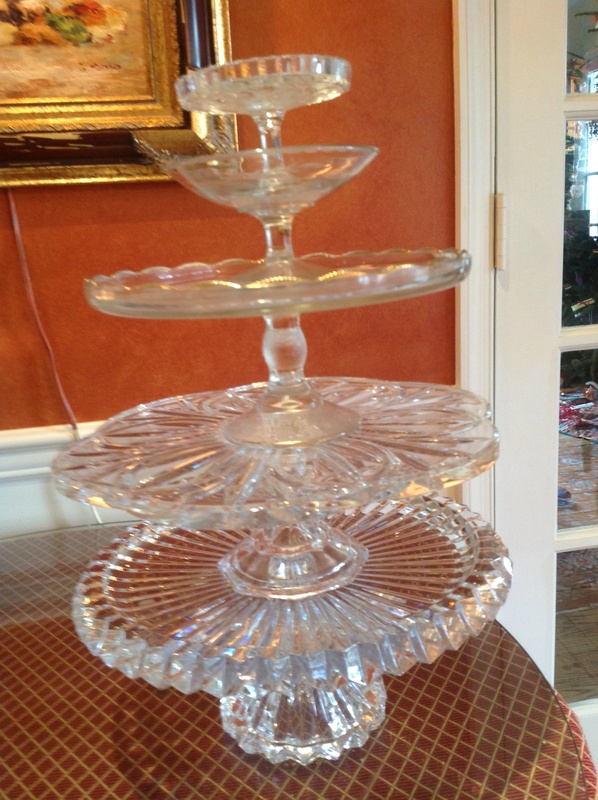 It adds a touch of nostalgia to the dessert table and with its twinkling lights, adds to the magic of the cookie tower. 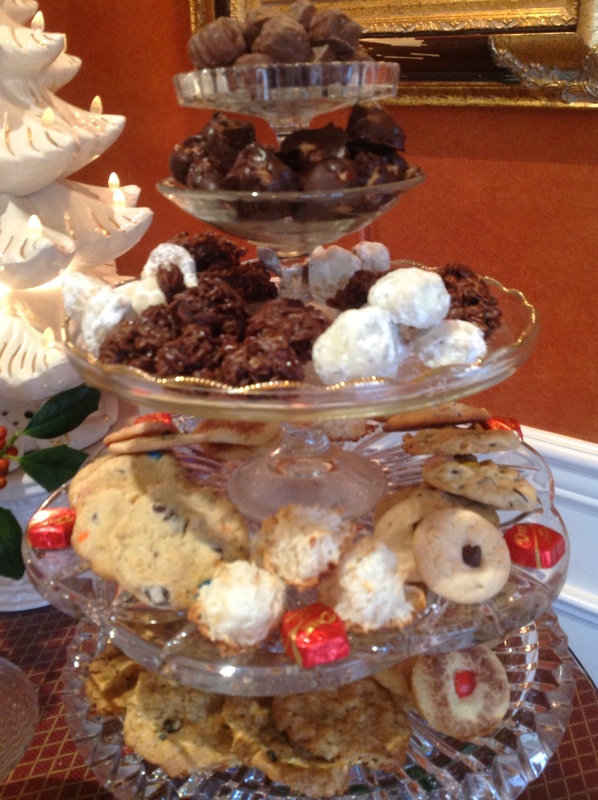 The cookie tower shining on the dessert buffet…but not for long! 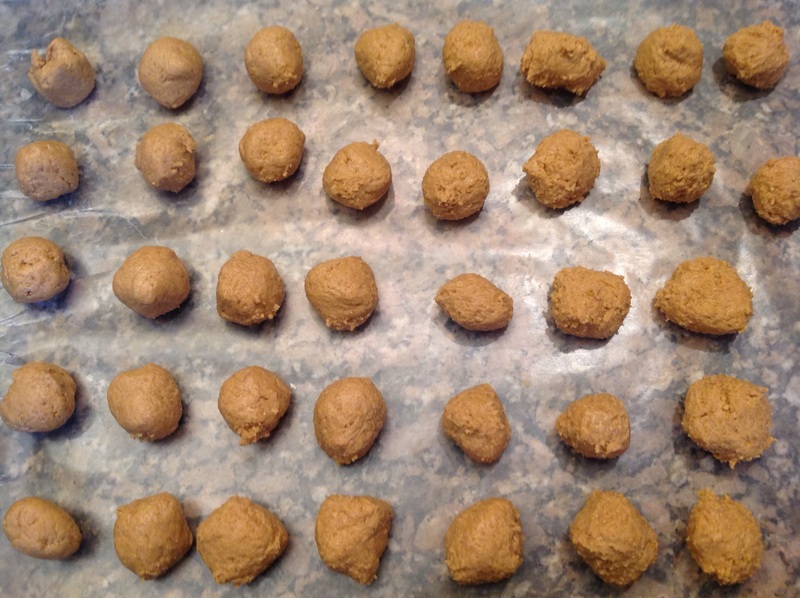 And the favorite cookie is…Peanut Butter Balls. This cookie is called by many different names in different parts of the country: buck eyes, chocolate peanut butter truffles or peanut butter balls. No matter its name, it is always irresistible. I mean chocolate + peanut butter? That equals a match made in heaven! Try to eat just one! 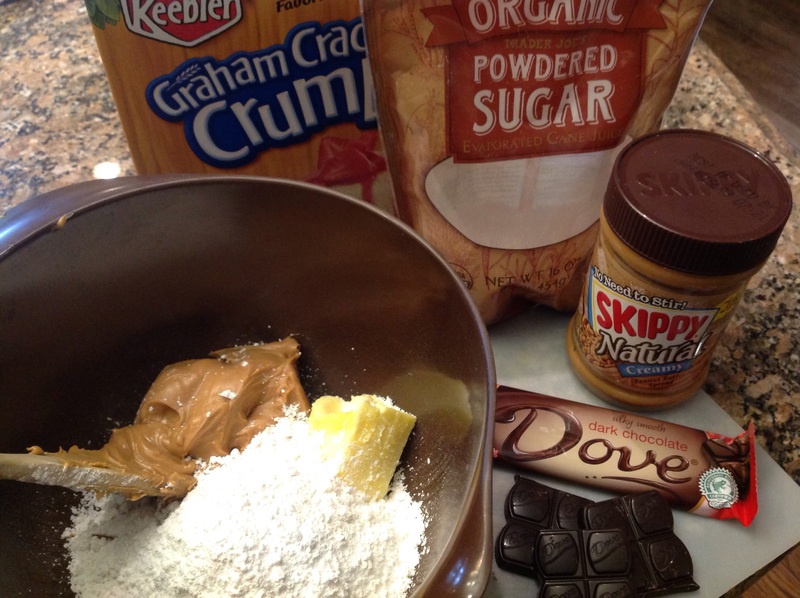 Method: With an electric mixer, cream together the sugar, peanut butter and butter until smooth. 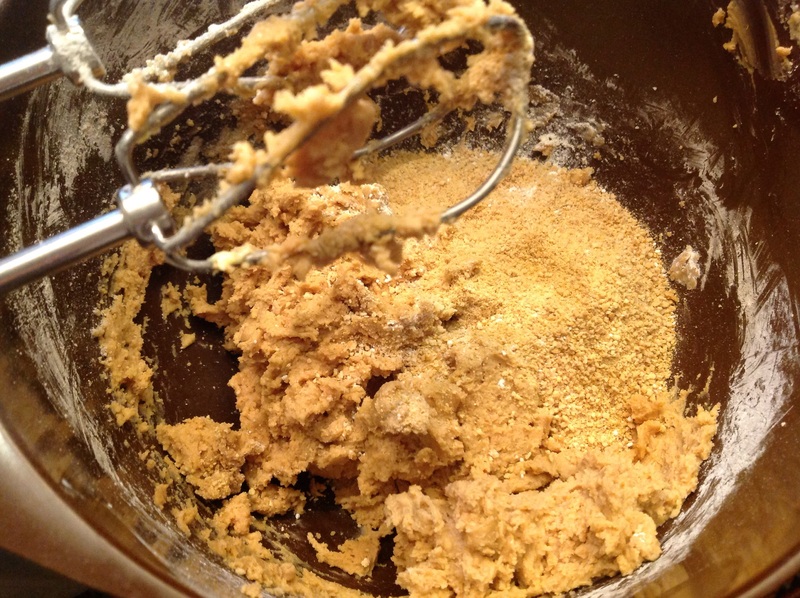 Stir in the Graham cracker crumbs. Form into 1″ balls. You may want to chill the dough for easier handling, about an hour, although it is not necessary. Melt the chocolate and let cool a bit before handling. 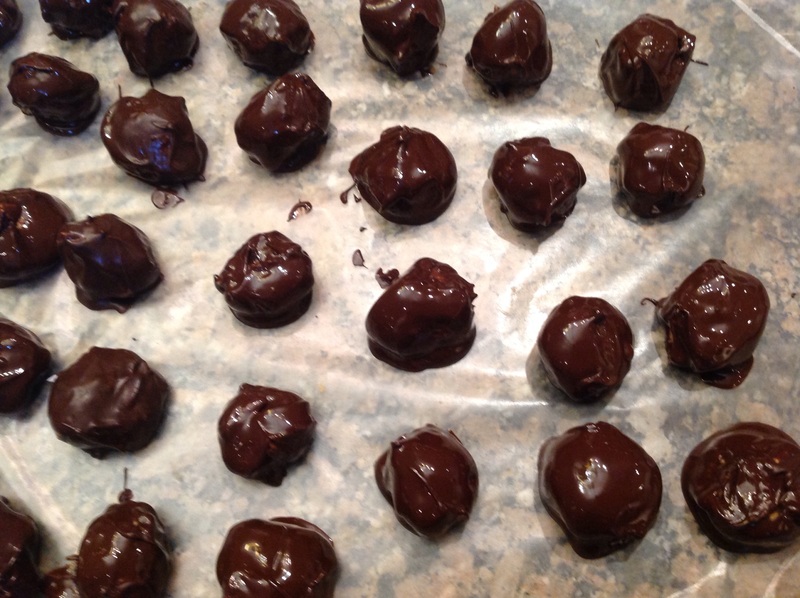 Coat each ball in chocolate and place on a sheet of wax paper to set, a messy business! If there are bare spots, use a spoon to add a small amount of melted chocolate to cover. If you want to double up the recipe I recommend making separate batches. May be frozen for up to 3 months. Sprinkling some crushed peanuts on top of the wet chocolate fancies these up. We like ours plain so they just melt in your mouth. Most of them familiar and comforting. This entry was posted in Entertaining, Recipes, Tablescapes and tagged Christmas cookies, Christmas cookies serving idea, Cool way to et up a cookie bar, dark chocolate peanut butter truffles, dessert bar idea, dessert buffet, peanut butter balls, stacked cake stands, stacked cake stands to serve cookies by Johanne Lamarche. Bookmark the permalink. What a beautiful idea – decorative and tasty. 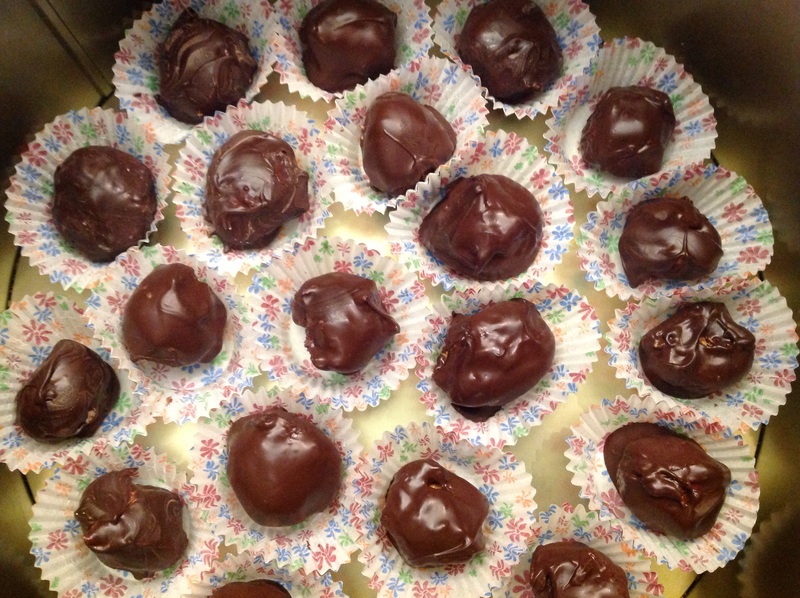 I might have to add these truffles to my cookie endeavours. It originated in Canada to me! Melt in your mouth good. Thanks for visiting Hilda. You are welcome, Ginger! I can see your beautiful creations displayed this way. I am an amateur baker compared to your enormous talent! I Just find it hard to believe you’re not a baker! That cookie tower says otherwise! I like how the candle looks like a glass of milk to go with the cookies! YOU would notice that little detail Ms Nichols!!!! 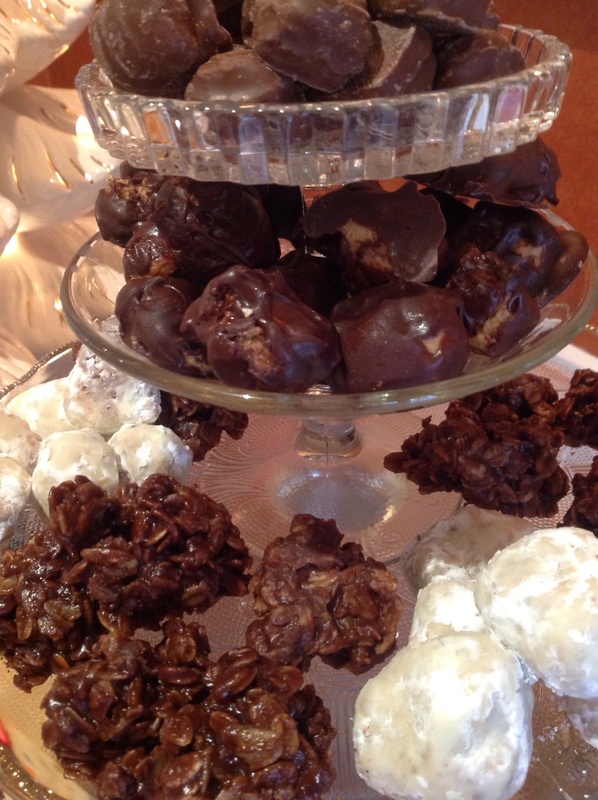 Most of my cookies for that tower are no bake or little bake or foolproof bake….!!!! All cookie gifts also go onto this tower so that helps fill in the voids my skills leave to be desired!!! So nice to hear from. I’m asking Santa to fix your back this year!